HOW WILL MY BABY BE HAPPIER With Beaming Baby Size 2 Diapers? YOUR HAPPINESS GUARANTEED with Beaming Baby Midi Diapers! 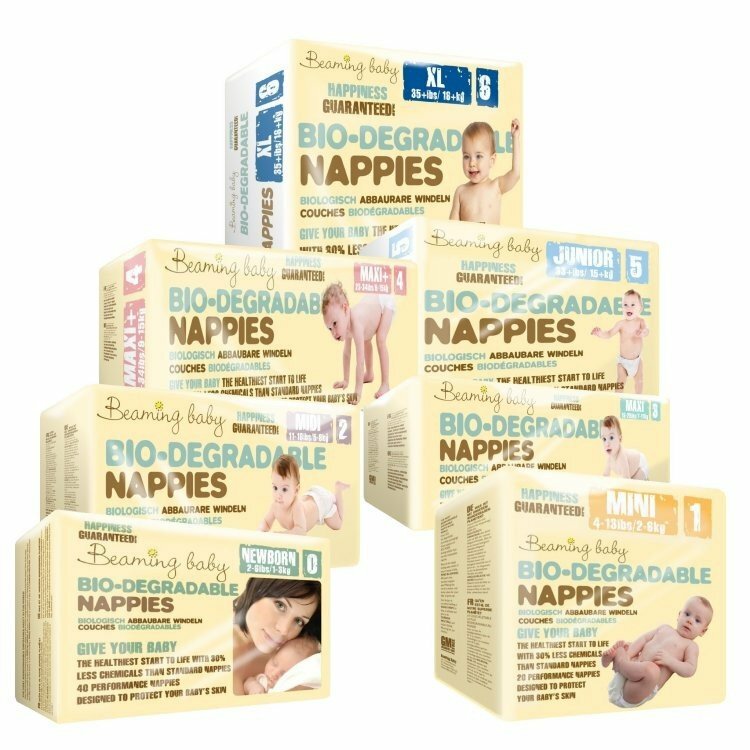 Beaming Baby Bio-Degradable Diapers Size 2 are Totally Chlorine Free and contain only Clean Plastics which are used in the Velcro patch and elasticated back and side panels. Having used these diapers for about 8weeks of my 10week olds life so far, we've never had any diaper rash. Now she is just wet at night and we co-sleep I've had no need to get up to change her until the morning so they're fantastic! I don't think they smell strange at all! Soft feel too! Baby is happy with not getting a rash but Mum & Dad not too happy that sometimes the diaper leaks at the top (fortunately not too often). These are great diapers. We use them at night as none of our reusables last long enough. Leake free & biodegradable, an fit well. What more could you want. My baby stayed dry even though her diaper was basically a water balloon by morning. They are absolutely amazing. We started off trying a variety of other diapers but then used our trial pack and haven't looked back! They are firstly far better for the environment but what surprised me most is how absorbent the diapers are. My little girl can go for up to 13 hours without being uncomfortable. She is much more settled, taking the cry for a wet diaper out of the equation! Love them. Highly recommend to anyone who wants to use disposable diapers! Great throughout the night, comfortable and absorbent. Everything I need from a diaper. Very satisfied with the service and the quality of the disposable diapers. Amazing for our baby's skin l. Whenever we find ourselves using a more mainstream brand he ends up with a diaper rash but not with Beaming Babies diapers! These are by far and away the greatest disposable diapers we have used. Our small person has had some serious poopy issues. Other nappies have leaked and not been up to the task. The Beaming baby diapers NEVER let us down. They can handle a hell of a lot of poop, absorb multiple wees and they live up to their promise of no diaper rash - unlike some other more famous brands I could mention. Plus they're better for the environment! Winner winner chicken dinner.